When it comes to growing as a photographer it is important to remember that you are never as talented as you think you are. Being a master photographer is not possible because being a master means you make no mistakes and requires perfection, which doesn't exist. Talented photographers want to become better at their craft. Growing as a photographer requires the willingness to try new things. Trying new things can mean trying new gear, learning from others, learning new techniques, using new software, taking an adventure, etc...Basically, trying new things can be an endless task and that is alright. It is all about the journey and the destination is just a bonus. In my journey as a photographer I have realized that I make a lot of mistakes and I know very little about photography. Do I want to know everything about photography? The answer to that is, no. What I do know is I enjoy learning new things and trying to make my old work better. Believe me, I really hate a lot of my old images. I look back at my images and can see just how terrible my photos were. I am glad that I am able to see some improvements of my work every year. The key for me is to keep shooting, try new things, and learn from my mistakes. In a recent photo shoot at Hanging Rock State Parkway in North Carolina I wanted to see if I could get a better image of the Lower Cascade Falls. I have been there several times and I really enjoy visiting the waterfall. However, I have never really liked the images I had taken there in the past. My goal was to take several images of the waterfall and try some new workflow ideas with the newest images. I had a pretty good idea or what style of image I want to create. However, as with all my post processing sessions, I have no idea how the photo is really going to come out. For me, that is the fun part. The Lower Cascade waterfall is a small one but the amount of water was very good due to recent heavy rains. I wanted to get to the waterfall before the visitors started showing up and trying to swim at the base of the falls. You can see by the image that the waterfall has a lot of rocks that visitors love to climb, which is not a very smart idea. Luckily for me, the water was too cold and no one wanted to take a quick dip. I decided to take most of my gear in my new camera bag and my tripod for the shoot. I wanted to make sure I had all the gear I needed for any shot. I took a variety of shots but my composition choices were limited. I was able to get a couple of nice images I could work with. After returning home, my objective was to work on a completely different workflow to see if I could produce a better image than I had taken before. That is the trying new things part. Part of trying new things in photography for me consisted of doing some irregular post processing. I shoot all my images in RAW and on this occasion I did some bracketing. My post processing consisted of using Lightroom, Photomatic and presets from Sleeklens. I am a big fan of presets and collect as many as I can. Presets saves me a lot of time in processing and gives me a great baseline start to work with. 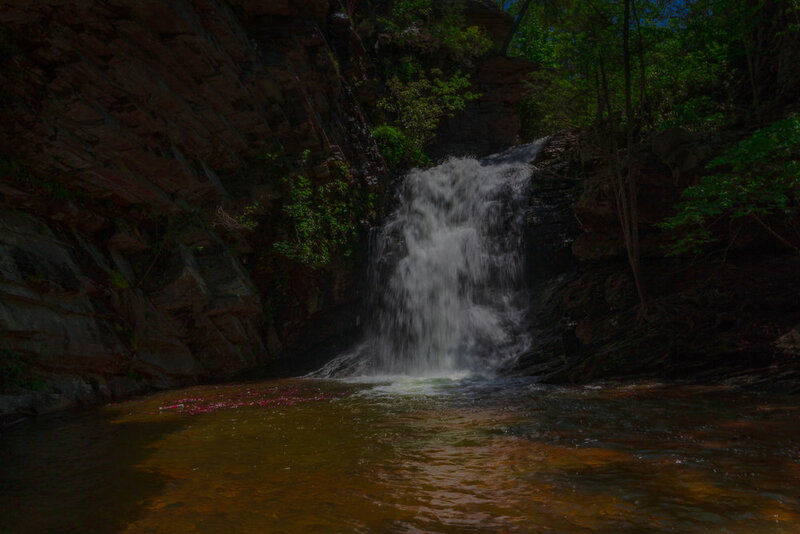 For my image I used bracketed photos of the waterfall, used Photomatic to get a slight HDR effect and then applied a nice preset. My goal was to create an image that had an artistic feel to it. I wanted clarity, sharpness, and color. Below is the before and after photos of the Lower Cascade WaterFall. The first image is straight out of the camera with no possessing. The after photo was the look I was going for. As far as I am concern it turned out pretty nice. Photography is all about trying new things and finding out what works for you and your style. I feel one should work on developing a style that is all your own and never listen to critics. Better yet, don't be a critic. I feel it is very important to continue to learn something new whenever you can. You never know how much better you will be next year by trying something new, so keep shooting.